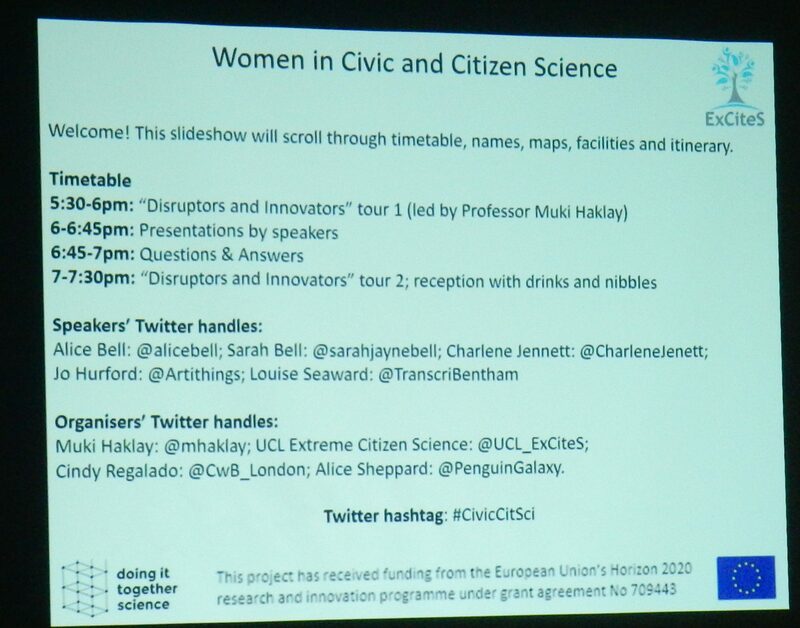 Following Charlene, Dr Cindy Regalado from UCL Extreme Citizen Science introduced “Doing It Together Science” project. This is EU funded project, and the people in the room are part of the project by joining the event. This project is special – the different people and organisations that are involved in it came together with the question “what do we want to do” and this created a group of special organisations. People in the project a passionate about doing science together – creating engagement space, curiosity and interest in biodesign and environmental sustainability. We do that through a range of events and also producing different tools and information that allow sharing knowledge between organisations. Facilitators across the projects are sharing information and work together to create many types of events – over 400 of them already. Examples of that include the work of University Paris Descartes (UPD) in Paris, they run activities to engage people to create games for science. In Poland, there are” train the trainers” activities to introduce other people about sustainability. In RBINS in Brussels, people who are excited about stick insect – scientists and amateurs share their interest. People in Medialab Prado run events that are two weeks long and create new ideas and innovations. In Geneva, a biofabrication event took place, bringing people who experiment with biotechnology. The Kersnikova Institute in Ljubljana explored in freakation bar issues of science and ethics – provoking questions instead of simple ideas of science. 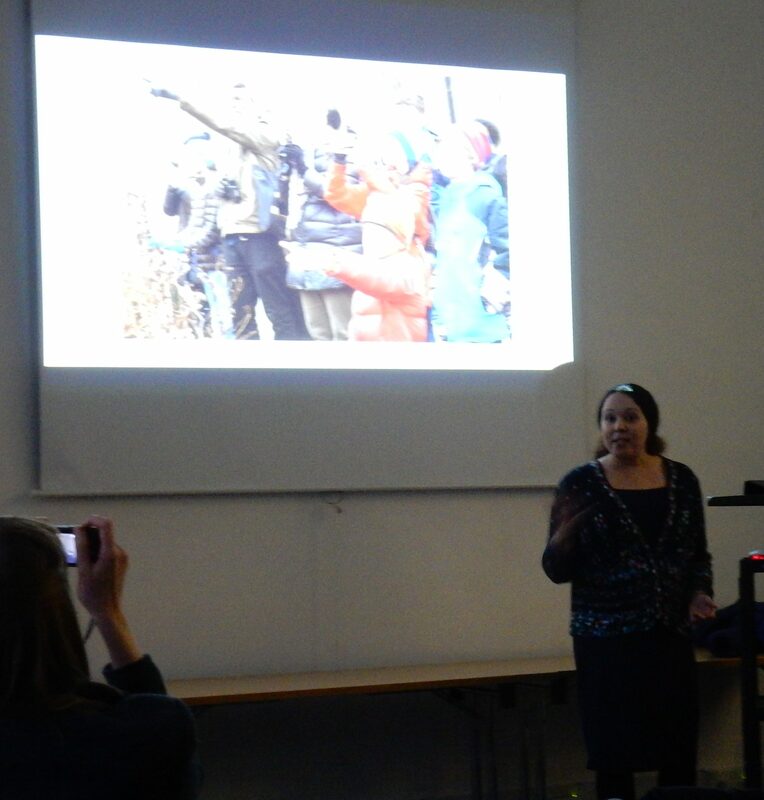 A Polish delegation visited London to learn about citizen participation in air quality monitoring, and at UCL technologies for recording the environment with kites, or through DIY biological research took place – teaching people that they can do science. Finally, the Science Bus toured Europe and allow us to reach out groups that are usually under-represented in science engagement activities. The next talk was given by Dr Louise Seaward, Research Associate on the Bentham Project, will introduce us to the project and Gill Hague, one of the volunteer transcribers [See Louise report of the evening on the Transcribe Bentham blog]. 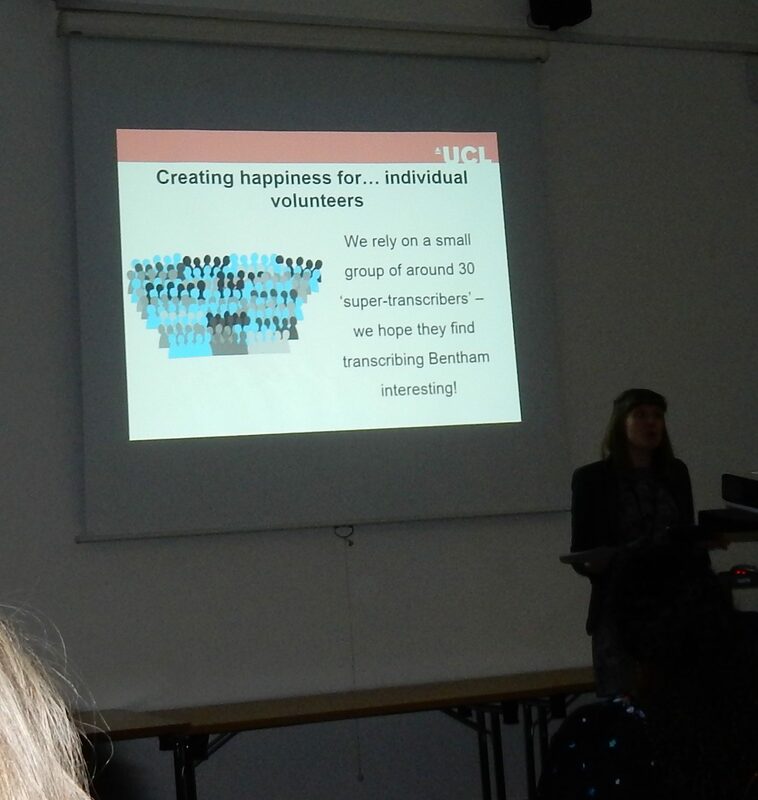 Louise described the Transcribe Bentham project – a flagship humanities project at UCL where a significant number of the most active volunteers are women. The project asks volunteers to transcribe papers written by UCL’s intellectual inspiration, the philosopher Jeremy Bentham (1748-1832). 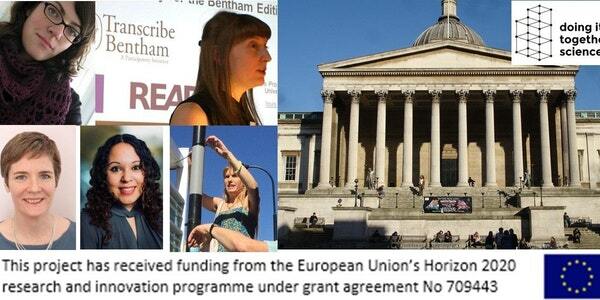 The project is about the writing of Jeremy Bentham. Transcribed Bentham launched in 2010 and is the first crowdsourcing project in humanities – the idea is to ask volunteers to type and transcribe papers. Volunteers worked for 7 years and almost 20,000 pages of writing. Transcribe Bentham show manuscripts by him, and volunteers are free to choose a paper and work on it. Some of them are very difficult – the handwriting is very bad and he made changes, crossing text, changing his mind. Within the project system, there are tools to markup side notes and very complex ways of marking the page. The project is creating happiness for scholas – the purpose is to create a scholarly edition of everything that he wrote – the project is running since 1959 and it’s not halfway through, this is also a resource to the wider community – allowing other people to learn about Bentham and his writing. Most of the work done by around 30 super-transcribers and they are finding the project interesting. Currently, 58% of participants are men. People have higher education and based in the UK and US. Gill then described her experience with the project – she had a career in IT, TV, and legal services, and as a freelancer working from home, she had to be available at a call and wanted something more interesting to pass the time than watching daytime television. In 2011 logged on to learn more about crowdsourcing which was new at the time following an article in the Sunday Times that mentioned the project, and she saw the value in Bentham writing based on previous knowledge in economics and in legal work. She then set out to transcribe one page, and then found the content very interesting, with journeys unfolding and Bentham views on the experience. Having involved in the legal process for a long time, she found Bentham views on legal issues interesting. She can find it as something that she can join more or less as much as she can and interested to do – sometime 10-15 hours in a week. She very much like the idea of getting an acknowledgement in the next edition of Bentham publication and that is very satisfying. Transcribing is fascinating and there is good feedback and response from the team. Jo Hurford, local artist and community leader, was part of a group of concerned citizens to approach UCL’s Extreme Citizen Science department to learn how to gather scientific data about deteriorating air quality and further environmental concerns in the context of HS2 development around Euston station. Jo opened up and noted that people who attend UCL have good opportunity to learn new things – and the work that UCL and Mapping for Change are doing with community groups has been mentioned in the report by the chief medical officer recently. The experience of the Euston communities is showing the limitations of citizen science approaches but also the new lessons that are learned from it. The community members knew about air quality issues form reading the news – they suspect that they were living in a polluted part of London – and experienced a building site for 3 years already. They wanted to have a baseline of air quality while the HS2 bill passing through parliament and wanted to know more about it. The community wanted to keep trees in the area of Euston until HS2 have a clear plan for the development of the area. The campaign to try to protect the trees fails. However, using the construction routes they positioned diffusion tubes and found that half the monitoring location is above the EU regulation. There are projects with big impact on the area (e.g. making Gower St two way) and they learn through citizen science and tested the particulate matter and seen that air purifiers do work in filtering them – so they ask for air filters for residents that are badly affected by the change to the plan. There are discoveries through collaborations with UCL – for example, Google Scholar is new, but the information that you get from academic publications is overwhelming, and she contacted specific people and look at different academic papers and use them to show the link between poor air and the health impact. When they spoke to HS2 in the House of Lords they used some of their funding, but they weren’t convinced by the argument. Because people in power don’t listen to communities, and they have created scarves on trees and explaining the different trees in an area that doesn’t have enough green spaces. They protested against the tree panel of HS2 – they ignore personal views. The community transport working group suggested alternative schemes, but at the middle of the night, the HS2 contractors cut the trees. 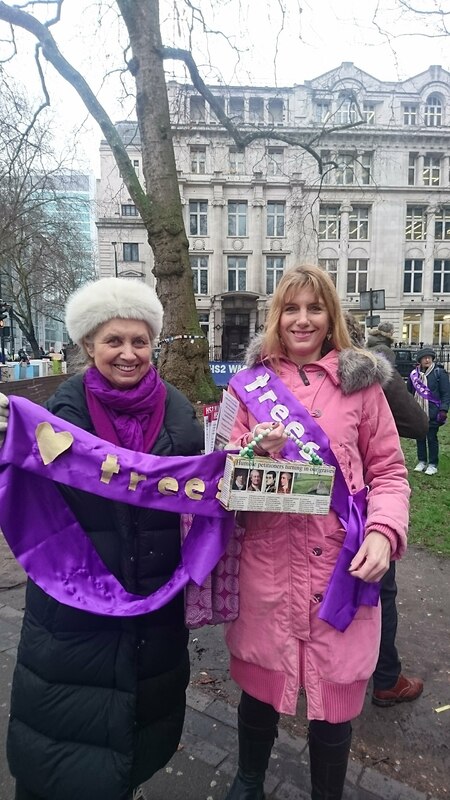 They organised painting of the cut off trees, and campaigning toward Sadiq Kahn – they did different activities – from chaining to trees to demonstration next to the GLA building. We need to participate in democracy and participate in science – we need to use it to bring evidence and to be listened to. Next, Dr Alice Bell, science writer and director of communications at climate charity 10:10, drawn on her research on the radical science movement to discuss science activism and community-based research in the 1970s and 80s. Alice has a double interest – day job in addressing climate change through energy issue and hobby interest in the history of science, that talk about similar things: citizen participation in science and technology. In the 1970s we’ve seen the radical science that can be relate to citizen science. Today people create DIY solar panels and creating DIY solar panels from the offcuts from solar panels and with some crafting, you can make your own and learn about it. Community events – making is connecting: people doing something together mean that they also talk about other things. Back to the 1970s, she discovered about civic science from the material that came out of clear up at the university library and found the “science for people” – magazines that were produced in the UK. One interesting example is the women’s collective issue that points to the problems that women experience in science with snakes and ladders that help male scientists and work against female scientists. Maybe the public don’t like science and technology because they have a reason – ideas about fixing science to make it batter. As a result, there were projects that are about citizen science. In the 1970s, Battersea air smell was rancid, and there are very little records of it (the Battersea smell) – the radical science group carried out a survey about the smell and the local council said that they can’t smell anything. The group helped citizens to collect evidence. The Sheffield occupational health group provided the ability to build and construct evidence – lots of groups didn’t have the ability to create the evidence that can be used about issues in the workplace. Today, in 10:10, there are projects to help communities and people to access energy and this is a way to do something about climate change: if you dismiss schools as places of social interaction, you miss a major site of activity. We can do this things not only top down through forcing people – we need to shift it in a way that worth saving and a place that community participate. There are examples of people that become experts and developing ideas about using unused energy to the train – new ways of powering electric trains through solar energy. This happens because a local community got interested in setting out energy system in a school and then developed their ideas further. The last speaker was Professor Sarah Bell, director of Engineering Exchange. Sarah’s talk was as follows: “I’m here because of my work with the Engineering Exchange at UCL, which is about providing opportunities for better engagement between engineering researchers and local communities in London. We work on a model of two-way engagement. The Engineering Exchange provide a pro-bono engineering service and we work with community groups and engineers to generate new research projects together. We’ve covered topics such as demolition and refurbishment of social housing, green infrastructure, air quality, traffic congestion. There was also a question about reaching different populations, including people in jail. Also about the collabroations across disciplines and the nature of expertise.